Rogers Ssembatya, who is he? The stereotypical attorney of late-night comedy shows is money-grubbing and indifferent to his clients. The reality is much different in that many attorneys provide pro bono, at no cost, help to clients who are deserving and otherwise could not afford to pay. Providing pro bono care is something that the State Bar of Montana is continually exhorting its members to do. In fact, all lawyers, not just immigration attorneys, practicing in state of Montana have to file a report each year detailing the pro bono activities or other contributions as a condition of being licensed. Ever since I became an attorney, I have listened to many requests for pro bono assistance. Some of these are very deserving, but outside my area of expertise. Others of them are a little perplexing in that the clients would seem to have the necessary funds to hire an attorney but they don’t believe that they should have to pay for assistance. Occasionally, I hear of a case that is truly deserving of pro bono assistance. I don’t think that I have heard a more compelling request than that regarding Rogers Ssembatya, a young Ugandan with life-threatening medical issues. His case was brought to me by Terry Fettig and Nadine Hart who have been trying to assist him since Nadine first found him as an orphan in 2006. After meeting Rogers in Uganda in 2007, Terry raised money to bring Rogers to the United States for medical treatment. He came in February 2010 and received treatment for all of his medical issues. He returned with Terry to Uganda in 2012 were Terry was building a house at the orphanage at which Rogers was originally found. On attempting to get Rogers a new visa to come to the United States for continued medical care, he was denied by the US Consulate in Kampala. Terry tried very hard in Uganda to get Rogers a tourist visa, but was ultimately unsuccessful. He also adopted Rogers in Uganda, but was not permitted to bring him here as an orphan as the adoption took place after the age of 16. Without any options in Uganda, Terry returned to the United States and along with a Nadine came to see me for assistance. I was able to explain what happened from an immigration standpoint. Terry adopting Rogers had hurt rather than helped Terry’s ability to get him out of Uganda. Rogers was now ineligible for a tourist visa as he was being treated as an immediate relative and immigrant. I suggested one more attempt at a tourist visa where Terry would explain to the consular officer that because the adoption had occurred past the age of 16 it was of no effect for immigration purposes and therefore Rogers should still be eligible for a tourist visa. Unfortunately the consular officer in Kampala was not persuaded by this argument. With all of the options exhausted, we decided to apply for humanitarian parole from the USCIS. Humanitarian parole is very useful in circumstances like this, and is considered on a case-by-case basis. In making a humanitarian parole request you are asking USCIS to authorize the admission of somebody to the United States without a visa. In the application process, we were required to show the USCIS that Rogers would not become a burden to the United States taxpayers should he be paroled into the United States. We were also required to show that Rogers had a means to come to the United States, and a place to stay. Through Nadine and Terry’s help, we were able to explain the need to the USCIS and how Rogers’s care would be provided and paid for should he be approved. The posted processing time for humanitarian parole is approximately 120 days, and by the end of this. I had heard from an officer in USCIS Washington headquarters who was in charge of processing our request. He needed additional information about how we would contact Rogers in Uganda. Terry had purchased a cell phone in Uganda and left it at the orphanage so whenever he or Nadine were visiting Rogers they would be able to use it to contact each other easily. With this phone number provided, we waited and the humanitarian parole was approved by the USCIS. Rogers was called to interview at the consulate in Paul and received the necessary travel documents. 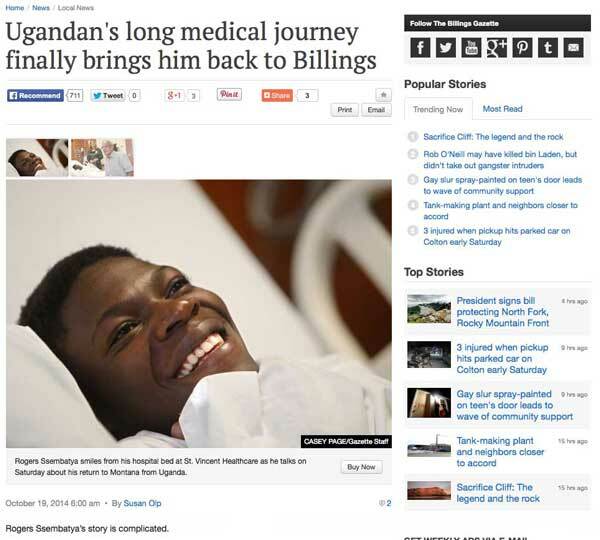 He arrived in Billings in October 2014, and immediately started a regimen of treatment for bone infections that he had contracted in Uganda that were life-threatening. The Billings Gazette wrote a story about his arrival in the United States, and the tortured route that this took starting in 2012. You can read the story here. Immigration Law of Montana, P.C. is happy to be a small part of the story, and to illustrate that lawyers, an immigration lawyer in this case, can make positive difference in people’s lives by helping the truly deserving on a pro bono basis. If you believe that you have a deserving case that needs pro bono immigration assistance you can contact us. Also, if you have a case where you believe that humanitarian parole would be appropriate contact us as well.